Read what visitors to our villa have to say! As we mentioned, the pictures cannot capture the true beauty of this paradise! We will remember these 10 days always and reflect to all of the restful moments & laughter when we need a "peaceful" spot in our hearts. Villa Tan Ry Doon- a little piece of Heaven! Ten days ago we left Chicago- it was 19 degrees. We landed here after 15 hours and it was 84 & beautiful! The next morning, with coffee in hand, I walked your gardens and fell in love with this place. Our time has gone way too fast. We have really enjoyed the island and talk about returning. A great place for a happy Christmas! Thanks so much for offering a splendid place to stay. We loved everything about Tan Ry Doon. I spent a memorable couple of hours in the hammock by the cliff. We loved the comfy bed, the pretty ceilings, the pool, the deck, the gardens, the rain and sun coming and going all day. Thanks for everything! We came, we saw, we swam, we sweated, we relaxed, we ate, we slept, we read, we took pictures, we beached, we scubaed, we snorkeled, we ate more, we slept more, we honeymooned. We appreciated the villa Tan Ry Doon. When I first saw the gate to Tan Ry Doon I was immediately taken back to Frances Hodgson Burnett's "Secret Garden". And when I opened it, I was there. ...the sweet tasting mangoes that grow right outside the veranda. ...the thundering waves slapping the beach in a booming rhythm. ...the night peepers that lull you to sleep and the songbirds that wake you to a new glorious day. ...the delicious fragrance of tropical flowers tickling your nostrils at every moment. ...the tropical winds that blow through your hair. ...the endless cerulean sea with rainbows above it and upon it. J & I both agree-this is by far the best vacation we have ever taken. We have so many wonderful memories to sustain us while we await our next visit to this beautiful paradise. The view, the beautiful gardens & the very comfortable & accommodating home provided us with everything we needed and served to feed our desires to be full time islanders. We met so many friendly island folks & expats who we'll never forget. Bruce Farara who took us on his boat fishing & went all around the island for the bird's eye view of the mighty "V". Trevor, owner of the Royal Palm Club, which we highly recommend for dinner. Menu is limited but atmosphere more than makes up for that! John Pont's hideaway restaurant on the beach @ Little Bay has a delightful Sunday BBQ. Thank you again for letting us stay in your home. You truly have a slice of heaven here on Montserrat. P.S. Lydia is a Gem! We arrived in Antigua late on the 4th and bright and early arrival on the 5th in Montserrat. Greeted with a breathtaking landing- they are masters of their craft. George greeted us at the airport and gave us a tour of the island. When we arrived at Tan Ry Doon we were greeted by Lydia- what a saint. She was so welcoming! The phone lines were out during our stay so Lydia left us with her cell phone- certainly above and beyond what we expected! Lydia's gesture was echoed by others hospitality throughout our stay here! Everyone was so kind. We were fortunate to meet Gulbert, the gardner- it is obvious he loves what he does. The gardens are breathtaking at any time of day here at Tan Ry Doon. One of the things we loved most about our time here has been peacefulness and internal beauty of the island. The Tan Ry Doon experience is so difficult to find this day and age. This trip was our Honeymoon, and we hope to be back to celebrate many more years of happiness here. Gerri and I are just about packed for our trip back. We are heading to Florida before we head for home and begin our house building project. Our stay has been as memorable as last year. This visit we were able to meet and spend time with a turtle biologist from the UK, hiked from Drummonds around Silver Hill to Margurerita Bay, 6 Hours, with Scriber, who also took us on the oriole trail. We snorkeled Woodlands and Rendezvous beaches, made and ate bread fruit, sour sop and sugar apple. Dinned at Olveston House, Gourmet Gardens and Tina's. Met the owner of the cement plant who took us to the top of Garibaldi hill in his 4x4. Watched the turtles come to nest at Lime Kiln, and of course soaked up the sun and beautiful pool that you have improved. Tan Ry Doon is the place to be. I'm sitting outside at the table looking out over the ocean, watching the sunrise and I can't believe I'm here. Like all great, rare dreams it's nearly over. We're flying out this morning, and as we're getting things together to take our final drive to the airport, I'm still a little amazed by how beautiful this place is. Every morning when we awoke the first thing we saw was the ocean. It's got to be the greatest view on this island (from Tan Ry Doon). We've loved everything about our time here- especially the house, the pool and the peace and tranquility that come from having such a private, fully outfitted villa where we have everything we need and don't need to leave for anything. When we have left it's been to visit the great snorkeling sites, the beaches, the volcano, to visit with Peter & Ken, or to eat at the Attic or Tina's for really great food. It's been a fantastic destination honeymoon for E and I and we thank you both for the rare gift of being here. One of the "Best" homes we've stayed in on Montserrat! You guys thought of everything- very exciting stay- 2 explosions from the volcano! Very sad to see poor Plymouth! But now there's the 'New' Montserrat! We did get to experience some of the beauty of the island....views on clear days, hummingbirds excited about freshly watered trees, extremely friendly people (Lydia, Yvette, George, Mariet @ Gourmet Gardens, and the lady who is the cook @ Tropical Mansions Restaurant...the neighbor Bridie and anyone we came into contact with). We enjoyed feeding the chickens that visited us for 3 squares a day! (They love crackers) we got to see the big frogs at night & we certainly heard the tree frogs at night (M says that if they were in West Virginia, he would hunt them!) Jim & Norm you truly have a beautiful, tranquil paradise, and have made sure that everything that you would ever need is here. Thanks for the wireless internet! T-always loves sunbathing- some sun is better than none! Where do we start! We had such a great time at Tan Ry Doon. What a wonderful slice of heaven you have here. Spent our days lounging by the pool & walking the gardens. It's a little different than our Minnesota garden! The people of Montserrat are the friendliest we have ever met. We truly enjoyed talking with Lydia- what a wonderful lady!! We loved the frogs that visited us every night- man they are big. Next time we want to see a chicken frog. Thank you for sharing your home with us. We will be back! G + I began to acclimate ourselves and now it's time to return to NY. 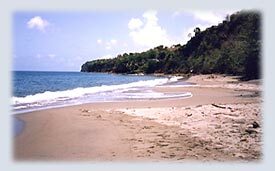 We immersed ourselves in Montserrat life, no TV, hiking Jack Boy Hill, swimming Carr's Bay, kayaking, diving, snorkeling, St.Peters festival, dined with the Montserratians at the old school. Took hundreds of pictures and videos. Hope to get a few to you. Hiked the lahar to the old golf course & beach. Tina's for lunch twice, Olveston House was great. What to say is 11 days was not long enough. The villa is all you said it would be. We are very satisfied. Would love to return so don't be surprised if we call for next summer. Pray the gods keep the volcano quiet. Except for liquor- there is plenty to be bought! We had the best view on the island from your deck and loved every minute of our week. And what a great kitchen! After 3+ weeks it is difficult to leave. We loved our time on Montserrat and at Tan Ry Doon! We met lots of great people and plan to return as soon as possible. Running into chickens, goats + egrets on our way anywhere! Night sky-felt like we were in a planetarium- but alone! PS- When we're back in Jersey + feeling sad, we'll think of a few of our "favorite things" + then we won't feel so bad! Many thanks! We will be back (hopefully sooner than later). Although we have not met, (but I do hope we do), we are certainly friends. I have not had the pleasure to own something so gorgeous, yet share with others so generously, so I'm not sure this journal-entry will do justice. Yvette & Lydia are so nice - and so helpful- so thank you for that. The villa, so appropriately called "Tan Re Doon", is beautiful and its trees and flowers speak to a "yooper" like me. Yes, I'm from the upper peninsula of Michigan, and being here with my wife has given me that hard-to-find feeling of "home", even though we've only stayed but a week. We have had such a splendid time on our honeymoon, which we waited for for 6-months, and it certainly could not have been w/o the generosity and kindness shown to us by Norm & Jim, as well as the people of Montserrat... everyone has been so welcoming, and so helpful, that a longing has already blossomed for the next time we visit Tan Ry Doon. What a perfect slice of heaven you have here. From the moment we walked through the gate, we felt a calm wash over us. Your home is truly wonderful: warm & welcoming. Your kitchen is wonderfully equipped- so well equipped that we were able to prepare a full Thanksgiving (Canadian!) Dinner....yes, I know! Roasting a turkey when it's 90 degrees out side?! You know what they say- you can take the girl out of Canada but you can't take Canada out of the girl! We also prepared a Key Lime pie with your limes and coconut pudding with coconuts from the garden & used recipes from your cookbooks. 1. The incredibly friendly & helpful people. 6. all the wonderful "critters"
It's our last night & we just finished another great meal at Gourmet Gardens (we sat next to the Governor). We're sad to be leaving but I know we'll be back again. Thank you both so much for sharing your home with us. Very pleasant visit. The people are extra-ordinary to say the least. Omar however was a different story! It was amazing to watch the changes before, during & after Omar! A very well stocked kitchen, as well as the size, layout & location, all added to the whole experience! Thank you again for a great vacation. So many experiences and memories to share you would need a new book. So we'll just share the highlights. Perfect, the first thing that comes to mind as we sit and recall our first time here on Montserrat and at Tan Ry Doon. Reading some of the entries is like traveling through our stay. Hiking to the Dry Waterfall with Pie, 3AM visit to Woodlands Beach to see a Sea Turtle, getting to know some of the island folks like Troy and Melanie @ The Green Monkey. As nature lovers we were delighted with the frogs, iguanas, pelicans that patrol the coastline and all our other visitors. So many great places to eat, Johns @ Little Bay, Tina's, The Attic, but our favorite was definitely Ziggy's. It was a struggle to pick one event that stood out the most, but we agreed that it was on Friday the 18th of July, Darren planned a surprise dinner @ sunset at the house, catered by Mrs. Ryan. During a break between Dinner & Dessert we took a stroll down to the cliff to watch the sunset. Darren took to a knee and Proposed!!! Needless to say this has been the most magical vacation of our lives, and we will be returning for our wedding and again and again! Yvette has been great with assistance on the planning of all this, Tom and Lydia were very friendly. Thank you both so much for sharing your home with us as we have each left a piece of our souls here --Until next time. Our 3rd trip to TRD, and we had ourselves another great vacation. The island was lush and green. Everyone was happy to see us again, guess they can see just how much the two of us really love Montserrat. The place looked great. Your TLC work with the house showed your love for the place. For some fun times, go to the Green Monkey Dive Shop/Bar. Looking forward to next year's vacation 2009. This was truly a wonderful place to celebrate our 10th anniversary. We travel a great deal, always seeking spots of tranquility and quiet in an increasingly hectic world, and Montserrat is certainly one such spot. Serenity is a precious commodity, and we felt it envelope us here. No traffic, no blaring music, no ringing cell phones....just the sound of the waves, the wind rustling the palm fronds, and the tree frogs. (I admit we could do without the roosters, but nothing's absolutely perfect.). The hiking has been magnificent, as has the time spent reading on the terrace, gazing over the lovely gardens. We have traveled to many Caribbean islands and stayed at many a lodging, but none can match the beauty and serenity of TAN RY DOON. It was a pleasure to come back to after a day of sightseeing or swimming and exploring, and the pool, views and gardens were simply spectacular! Highlights of our six days were hiking Garibaldi Hill, seeing the East Coast and the old Bramble Airport, walking the beautiful Isles Bay beach and snorkeling in Rendezvous Bay--but only after a mildly challenging Kayak ride out. The underwater life was great! We will miss our sunset dinners on the patio and the crashing surf. Hope to return again one day. We had a wonderful vacation. The villa is beautiful with great vistas out every window. Very much enjoyed sitting on the porch + watching WHALES! go by as well as the variety of birds. Great island with wonderful friendly people. Jim & Norm your gardens are spectacular. Hope to come back some day. The idea was planted 20 years ago, when we read "My Little Island" to our toddlers. Finally, we're here and Montserrat has not disappointed--what a lovely island! The blue water, the breeze, the lush vegetation, the birds, the frogs at night....all perfect. And Tan Ry Doon. The place lives up to its name. Wonderful laid back feel, with everything we could possibly need for the week inside the house, and, outdoors--it is simply divine!! Your garden is visually interesting, peaceful to walk around and the hammocks--perfectly placed! Thank you for a dose of serenity. When the Tan Ry Doon gate opened.... I was speechless! As I walked the grounds to absorb the gardens and the ocean views - I thought...this must be heaven. Out came the camera. I have hundreds of beautiful memories. I'm certain I would love the two of you as I love the way you have expressed yourselves throughout your property. Thank you Jim & Norm for creating this beautiful dream, but especially to our friends, N & C K for inviting us along for this fabulous adventure. We weren't sure we were going to make it in due to very bad weather. However, we did. Arrived later in the evening after dark and went to bed. The next morning, woke up to a beautiful view. Spent the next two days exploring the island--in and out of the little bays and towns. Thank you for the opportunity to enjoy your paradise. We will be returning. Your villa was very comfortable and well equipped. This was a relaxing holiday for us. So many locals invited us to their homes. It was great fun. We hope one day we will be able to meet you both. Please come and visit us in Maine. Our home is your home. I will miss my morning coffee walking through the gardens and watching the boats. Suffice to say this is the closest place to paradise we have ever been & we have been traveling the islands since 1971. We drank from the fountain & certainly hope this is not our last trip here. Thank you for a very memorable vacation. Our occasional evening visitor- the toad named Bufo. Unfortunately, it's our last night here in Montserrat. What a lovely Island--Tan Ry Doon is amazingly beautiful. Thank you Jim & Norman for providing your guests with every provision under the sun. Here's what we enjoyed: Woodlands Beach, hiking "Lawyers Mountain", the Green Monkey Dive Shop- and kayaking to Rendezvous Beach, sunset at Lime Kiln Beach. A fantastic vacation! Oh! And naps in the hammock! Today is our last full day in paradise. We had wanted a peaceful, relaxing vacation which is just what we got at Tan Ry Doon. Although the vacation did not start out as planned...arriving after dark ..... We were delivered to the villa by Tom, meeting Lydia + Yvette on the way + learning a little about the island on the way as well. Going to sleep that first night to all of the unique sounds + the ocean waves crashing on shore, we never imagined the sights we would wake to. It was more beautiful than we imagined. The pictures and information we had seen did not do it justice--the gardens and views are breathtaking. You had said you enjoyed working in the gardens + it certainly shows. This place could not be more perfect!! We spent days exploring this wonderful island + experiencing the warmth and friendliness of the Montseratians that we heard so much about. A drive to the other side of the island, as far as we could go, helped us to see some of the devastation the volcano caused.... Reinforcing the fact of what a powerful force nature really is. We are so thankful the island and the people survived and we have been two of the fortunate few to experience life on Montserrat. Thank you so much for allowing us to share your beautiful home. This has truly been a special vacation--exactly what we wanted. We did drink from the ghaut and hope we'll be able to return, but until then we will have our beautiful photos + memories of Tan Ry Doon + Montserrat. *now to Jim & Norm----You guys have carved out a special little paradise here at TRD! It's obvious how much love and care you've poured into this wonderful spot, and we can't thank you enough for sharing it with us. We loved it like it was our own. We've been traveling the Caribbean for about 25 years now- usually 2 trips a year, and we've been all over- mostly small quiet islands. We've stayed at some beautiful villas, but none can compare to TRD! Your attention to detail does not go unappreciated. Everything from the array of kitchen accessories & gadgets to the layout of your gardens and plantings, to the artwork and whimsical decoration, Perfect- Perfect- Perfect!! You want for nothing here- and your love and care come shining through. We hope you have a long and wonderful life here...it's a magical place. Our 8th day here. Not a drop of rain, so far. There goes a pelican-lots of them seen. This is one of the loveliest islands we've stayed on - (St. Martin, Saba, Anguilla, Antigua, Guadeloupe, Dominica is close). We appreciate the green hills, the ocean breezes, the welcoming people: esp. Lydia, "little" Tom, Yvette. "Rham & Sons" are a trip- nice market. Here, the pool & gardens are gorgeous- floating in the pool is the way to work on your tan without hyperthermia. Well today is our last day here. We have enjoyed our stay without question. Tan Ry Doon was exactly what we were looking for, for our honeymoon. Our advice to future guests- don't miss sunsets, eat dinner at Ziggy's (it's fabulous! ), The Royal Palm Club is great for drinks & atmosphere, Jumpin' Jacks is wonderful, a boat ride from Troy at the Green Monkey is an excellent way to see the island. If you have any questions, Yvette at The Neville Bradshaw Agency is a joy and will help you 100%. Make sure you wave at everyone and converse with whom ever you can. Everyone has an interesting story. Jim & Norman-We can't thank you enough for sharing your little piece of paradise. It made our honeymoon more special. We hope to come back soon. Dragonfly who hovers over pool ="Marcus"
Medium Lizard, bright green= "Puff Daddy"
Black & green hummingbirds (2) = "Evangeline" and "Angelina"
We also sighted the big iguanas, but they hang a little too close to the cliff to get very friendly with. Oh yeah, plus, they are big iguanas! The hammock down at the bottom of the hill is fantastic- much like being in a cocoon! Though we did not spend much time away from the house, we hope to meet more locals next time we visit and also hike out to Rendezvous Bay. As such, we were far too content being lazy by the pool to muster up any energy for what was described as a "brisk hike". We had ourselves a wonderful sixteen days at "Tan Ry Doon"
This has been our second visit, and this vacation was even better than last years. The gardens looked beautiful, so many different trees, shrubs, and plants. We could see where you guys expanded it from last year. Your efforts are paying off. Wish mother nature could have provided more rain. If you're looking to get some sun on your body, walk the gardens with the water hose, and give the gardens a good drink, then go back to the villa and pour yourself a good cold cocktail. It will taste better than ever! We will be saving up our nickels and dimes, looking to spend 3 weeks back in Montserrat in 2008! Montserrat & Tan Ry Doon must indeed be the closest thing to paradise that one can experience. I feel honoured to have spent the last 10 days here. Everyone here has been so friendly + it is indeed a culture shock (a happy one), to that of the UK where if you were to even smile at someone you would be greeted with a frosty response. Lydia has been extremely supportive, as has George who we have seen on many of our explorations of the island. The peace and serenity has been a welcome change, however we must now return to the hustle & bustle of our 'normal lives', however we will hopefully return one day. Until then we have our positive memories & hundreds of pictures to keep us focused until then. A visit to the MVO is a must! Day 1: After a long day of traveling, the N's from Vermont & Boston, the J's from the U.K. We arrived in Montserrat around 10 A.M. George picked us up at the airport, gave us a detailed tour of our route + brought us to Paradise! Day 10: We are sitting here on the veranda having our last cup of coffee and talking about all we've done here. We are leaving with beautiful memories. We will miss Clive, et el, who watched us every evening, eating at Jumping Jacks, delicious but hard to find, meeting warm friendly people, exploring the island + just slowing down. Thanks Jim & Norman. Lydia is around the corner for help and advice, and Yvette at Neville Bradshaw is really efficient. Enjoy your time here. We've been 'touched' by the spell of this special place. The amazing people deserve some luck with getting tourism off the ground, so we're telling everyone when we get home. Thanks for sharing such a beautiful and spectacular home with us! We have had a great time here seeing our old friends and re-visiting places. The villa is beautiful. We loved the iguanas in the garden, the kestrels and Clive the toad who visited every evening! Went down to Lime Kiln Beach last night at 10:30 and saw a turtle. What a paradise! Thank you for sharing this little bit of heaven with us. We have been here for 7 days and feel like Montseratians already! I don't know how Will and I will manage to wake up Monday morning to go to work without this fabulous view! The house, pool, gardens and that soul cleaning breeze will serve as memories of Tan Ry Doon! We have met so many people who speak fondly of you both. If you two are ever in Alabama-please come to the Tennessee River and let us treat you to some fried catfish, hushpuppies, fried green tomatoes & sit by the rolling river. Of course, its waters will only serve to remind us of your getaway to heaven called Tan Ry Doon! Andria and I had a wonderful time here at Tan Ry Doon. You two have created a piece of heaven here on Montserrat. Our two weeks went by so fast. Still the memories will stay with us forever. We experienced the volcano showing some of its fury, many rainbows, even the rising full moon gave off a colorless rainbow one night. Lydia was such a joy, very helpful. Tom Piper our driver could not have been nicer. If you need someone to help you get around Montserrat....he is the man!! George Riley, the "poolman" was as a colorful character as you meet here on Montserrat. He always announced himself by saying..."he is on top of the world" He could not have expressed it better for us, how we felt on "our little Island". We are already planning and looking forward to coming back to the Emerald Isle of the Caribbean in 2007!! Jim & Norm, your home in Montserrat is a true paradise. Despite a rocky start getting to the Island, our whole week has been wonderful. Bud & I have enjoyed meeting various folks all over Montserrat. We are amazed at some connections that we've noted with local residents. We especially want to say a special thanks to Lydia. She has been available for questions, directions & general help when we needed her. Yvette has been wonderful to work with & always has a special smile for you. Bud says that Ken & Peter's pizza was the best he has ever had. We "drank from the burn" and definitely will return to the Island. Believe it or not, there is an advantage to having your luggage "misplaced" by Winair, and that is that we didn't get to Tan Ry Doon until after dark last Friday. We had a quick tour of the house (thanks Lydia! ), ate our wonderful welcome dinner (thanks Ken & Peter! ), and went to bed listening to the waves crashing on the shore, but having no idea where we really "were". The delight of waking up the next morning to the spectacular vista was truly breathtaking. We couldn't believe we were at such a special place. And our vacation just kept getting better...exploring villages, beaches, shops, getting lost on almost every trip, chatting with folks at every turn, and the highlight of a "volcano tour" by Reuben Furlong, a displaced Montserratian--five hours of up close and personal exploration of such a life-changing event. Reuben also makes the Islands best goat water every Friday, which is our last dinner here tonight. and always, beautiful Tan Ry Doon to come "home" to. Thank you both so much for sharing paradise. A Fabulous view, beautiful gardens, a very attractive, comfortable, well-equipped house + perfect weather. We saw wonderful rainbows (including doubles + one triple) without any rain + amazing sunsets. Photographed humming birds + a resident banana quit that liked to catch the shy iguanas. Swam in the pool daily + at Woodlands Beach. Only wish we had arranged to stay longer. Thank you Jim & Norm-will be in touch soon about coming back. Thank you so much for sharing your beautiful home. Montserrat was everything I dreamed and more! Since I did drink from the ghaut I suspect I'l be back in the near future- hopefully for a longer stay. I can not believe you two were in cahoots with my husband to keep the destination of his "surprise" vacation secret. The day before we left (9/21) he did say we would be taking a plane. I thought it would leave from Albany. At 3 AM 9/22 we left Shaftsbury for Bradley Airport in Hartford, CT. Once there I saw the tickets for San Juan. I was pleased- the commercials about Puerto Rico always looked good. After going through several checkpoints, I was told we would be going to Antigua. OK, I can adjust to new plans. More check points- and then I found out the destination- and was flabbergasted- not quite speechless, as you know- that rarely happens. The pictures you showed us at twisted did not do this place justice. What a view! Watched the rain, and listened to the waves on the beach. Rick wanted to know what creature was making the evening "peeping" noise. I told him it was the iguanas- He groaned. We ventured out in the RAV 4 today. Rick climbed in the right side, buckled up and with white knuckled hands on the wheel put it in drive. The whole trip he mumbled "left, left, left". I was offering helpful hints like "slow down" and yikes- " a titch to the right". I'm not sure if Wendy would be proud or not. I want to report that there are psychotic roosters nearby. They crow at all hours. One was just making noise at 6PM! 9/26 We leave Montserrat tomorrow AM. What we are taking with us are wonderful memories of a fun time together. Thank you both for your part in this. You are both entitled to hugs when we get home. It's hard to imagine that there's a more perfect place to stay here in Montserrat than your beautiful and comfortable home, Tan Ry Doon. We've had one of the best vacations we've ever had, and we've had some good ones! We came to Montserrat with high hopes of loving it and wanting to make a future home here for ourselves. We have not been disappointed at all! In fact, very shortly we have an appointment to do our final negotiations to purchase a beautiful piece of property between yours and our new friends Ken & Peter. Speaking of new friends...We spent a couple of fun evenings with Ken & Peter (their welcome meal was wonderful!) & have really enjoyed their company & insight into living here. We also met Barbara & Rob down the road, Carol & Cedric at the Viewpoint, Susan & Betty at Tradewinds, Neville Bradshaw (also very kind & Helpful), and Alford Dyett, who will build our house if all goes as planned. Lydia has checked in on us & has been kind & helpful as well. One week and all this! Thank you for making your wonderful home & impressive gardens open to us for our vacation. It's been a fantastic week, and I can't wait to get back to Montserrat! We hope to meet you someday soon, future neighbors! PS - We hear your plant cuttings are feeding beautiful gardens everywhere...maybe ours someday, too???!! We had a wonderful time. The house is lovely. I'm sorry we couldn't stay longer. It's a great change of pace from New York City. We look forward to our next visit. My new husband & I have enjoyed a beautiful week here on our honeymoon! It is gorgeous here! Having a "well equipped" kitchen has been a huge help. Jim & Norm your home here is lovely, thank you so much for sharing it with us. Josh works in New York City & your home here in Montserrat was the perfect extreme for a relaxing & peaceful vacation! Josh actually planned our honeymoon as a surprise for me & I could not have been more pleasantly surprised! We are already looking forward to returning! We came to Montserrat & Tan Ry Doon for our 10th wedding anniversary looking for rest & relaxation & romance! We found it in this beautiful setting among the gardens & overlooking the water. We loved it. We wish Montserrat continued recovery from the devastation of the volcano & many beautiful days for those who come to Tan Ry Doon. Thank you Jim & Norman. This place is truly peace on earth! If only everyone could come to Tan Ry Doon. The view is breathtaking. Mornings are wonderful to be able to wake to this. Your home is so beautiful and I know we will be back. The people on the Island are wonderful. The villa was (and is) a pleasantly, luxurious, and tranquil residence. The Island is unique and beautiful. Good times & fun times. What can I say, Em said it all- Enjoyed the gardens the most, coconut ice cream + spiced guava- very yummy- It was very special to spend good quality time with my sister and my oldest 2 girls- What special memories I will always treasure- all in this piece of paradise! Wonderful house, wonderful view, wonderful time! Forgot the wonderful gardens and rainbows and sunsets. We walked up every hill on the Island. We're sure there's more up hills than down! Very friendly folks. An all around great time. You know the poem "how do I love thee...let me count the ways" - but of course - and the many ways we love Montserrat and most especially Tan Ry Doon, won't fit on this page. The trees are in full bloom, showing their appreciation and flooding the air with sweet fragrance. This mornings' shower, outdoors under a bright moon was the capping glory of our perfect vacation. Bless you for giving us yet another chance to share your home in paradise. As a birder, the highlight of my stay in your lovely seclusion was a Yellow-Crested Night Heron in full plumage drinking from your swimming pool at dawn. Thank you for a memorable vacation. Well..... you knew it would happen and it did. We fell in love with Montserrat and Tan Ry Doon! Privacy, sun, an incredible view and the most wonderful sights and sounds - our 2 weeks here have been fantastic - we're already planning our next trip! On a snowy night in Pennsylvania, we will remember counting stars at Tan Ry Doon! Thank you for contributing to this slice of heaven called Montserrat. I'm an entertainer, invited here as part of the "Paradise Regained Millenium Pilgrimage". Your home provided a much needed atmosphere of peace and serenity. My 1st time in Montserrat brought a 1st time seeing a volcano and a 1st time seeing a rainbow at night (from your balcony) over Redonda. The energy here is a reflection of you both. When I return I want to spend more time here at Tan Ry Doon. Tan Ry Doon is a perfect place to live, to dream and to relax. I've lived here for almost a week and enjoyed your gardens and house, both of them designed with love and care. We loved to sing, to paint, to listen to the waves and to observe a rainbow in a full moon night. Thank you very much for the ambience I could feel here. Everything about your house is fabulous - the house itself - furnishings - grounds - and view. It's beautiful! We've had a wonderful relaxing week on your island and we feel very fortunate that we found you! The views of St. Peters village to the north to Redonda and Nevis in front to the sunsets to the west are wonderful. The gardens of the villa are superb and show love and careful tending. The amenities and cleanliness of the villa show your thoughtfulness and caring for your guests. This is the end of another peaceful time on the island and now reality must set in and it's time to go. We came, we slept, we laughed, ate, drank, swam, and generally did ourselves justice. This respit is like no other. It's lovely and shows such care. Thank you so much! Tan Ry Doon was the perfect location for our honeymoon. The villa is superb, the view is stunning, the pool is refreshing- especially at dawn. C & P - Hermitage, Berkshire, U.K.